The Explanatory Note of the Lotus Sutra. 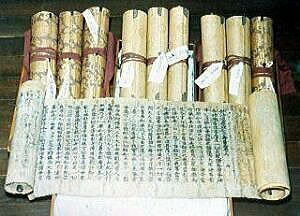 The writing which Nichiren Daishonin commented into the 8 scrolls of the Lotus Sutra and 2 scrolls of the Sutra of Immeasurable Meanings (sutra which is started) and the Sutra of Bodhisattva Fugen (final sutra). It became the basis of the Orally Conveyed Doctrine. Though there are 2107 chapters in total, three chapters seem to have been written by Nikko Shonin. These exist in complete condition in the Tamazawa Myohokke Temple on Shizuoka Prefecture. (Important cultural property of the country). The Record of the Orally Transmitted Teachings says: Namu or nam is a Sanskrit word. The Orally Conveyed Doctrines say: Nam is a Sanskrit. Here it means to dedicate one’s life, that is, to the Person and to the Law. Here, it is called "kimyo" in Japanese, and ''Ki" means dedicating, and "myo" means life. The object of dedicating has Law with a person. in terms of the Law, one dedicates one’s life to the Lotus Sutra. in terms of the Law, one dedicates one's life to the Lotus Sutra. 'Ki’ means dedicating to the principle of eternal and unchanging truth of the theoretical teachings. “Life” means that one’s life dedicated to that principle bases itself on the wisdom of the truth of the essential teaching that functions in accordance with changing circumstances. "Myo” means basing on the wisdom of the truth of the essential teaching that functions in accordance with changing circumstances. In essence,one dedicates one’s life to Nam-myoho-renge-kyo. Kimyo, dedicating, is Nam-myoho-renge-kyo itself. The commentary says. "The eternal unchanged truth, and the wisdom to be created at every situation changing. These are tranquil shining in a single moment of life”. Again,“dedication” refers to the element of physical form as it pertains to us, while “life” refers to the element of mind as it pertains to us. Also, “ki” is the mind Law, and “myo” is the physical Law. But the ultimate teaching tells us that form and mind are not two things. The one and only ultimate teachings mean that a body and a mind are not two.